When I started my blog, I had no idea what I was getting myself into. But I’m a good writer and enjoy photography, so I decided to give it a shot. I really wanted this one to be different than the short-Iived blogs I’d started in the past. This page contains affiliate links. For more information, see my disclosures here. After a year of sporadic posting and ‘winging it’, one of the few bloggers I followed back then released an ebook about blogging. I wasn’t taking my blog all that seriously at the time, but she seemed to know a lot about this blogging thing. 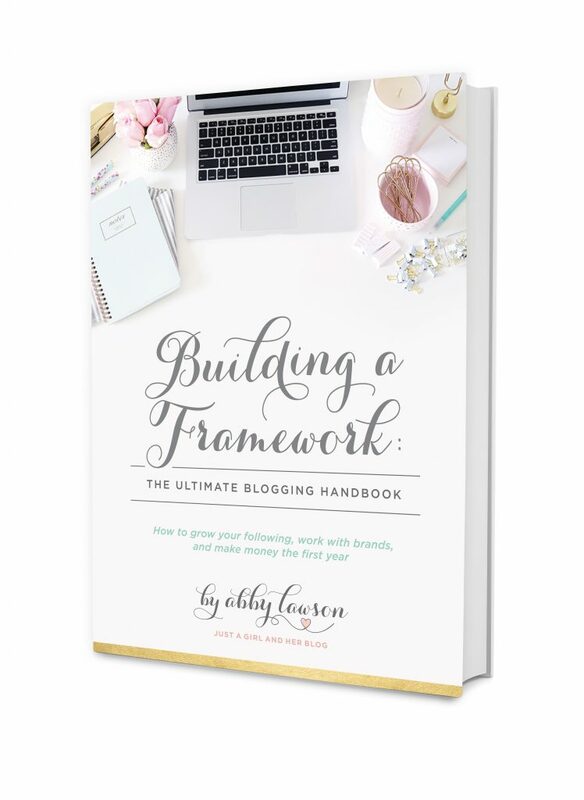 I bought Building A Framework: The Ultimate Blogging Handbook and it was a huge turning point in my blogging journey. Abby’s book introduced me to a whole world of blogging that I had no clue existed. 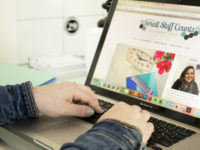 I discovered online communities of bloggers, sophisticated marketing strategies, the concept of turning a blog into a business and tons of blogging tools and resources. I soaked up every piece of wisdom in Building A Framework and finished it feeling fired up about taking my blog to the next level. I shared more about my blogging journey in this post. Abby just released the new version of her book, which is now also a course, and it’s so good! If you’re a newer blogger or a soon-to-be blogger, definitely check it out. As my audience grows, I receive more and more questions from readers interested in starting a blog of their own. Blogging has become a big part of my life, and I always love to support others who are starting their own blogs. Many of the common questions I’m asked are related to the tech side of things and educational resources. As bloggers, we tend to use a lot of tools to keep things running smoothly and to make blogging as efficient as possible. But there are sooo many tools and resources out there that it can be tough to figure out what’s worth your time and money. That’s why I’ve compiled all of my favorite trainings, tools and products into one place. I can personally vouch for the usefulness of every item on this list, and hope this is a helpful resource to you on your own blogging journey. Affiliate Marketing For Bloggers. This ebook will tell you everything you need to know about earning affiliate income for promoting products you love. Building A Framework: The Ultimate Blogging Handbook. This was the very first blogging book/course I purchased, and it has been a game changer. 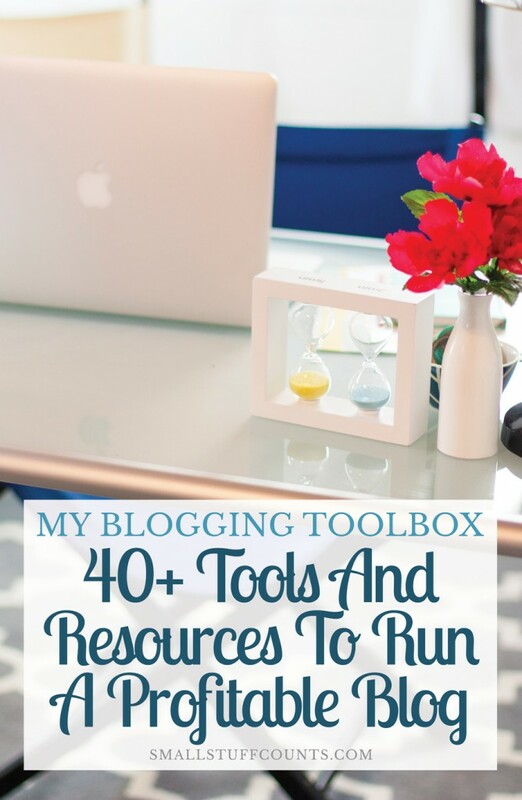 It is perfect for beginner bloggers or soon-to-be bloggers. Abby is a fantastic teacher and the content is so helpful when you’re not sure where to start. Oh, and the Facebook community is amazing! BookBoss: Write + Launch a Profitable eBook in 90 Days or Less. I would have never self-published an eBook without this course! Abby and Donnie are pros at launching eBooks, and this course truly walks you through every step of content creation and launching. The Facebook community is also helpful for bouncing ideas off of other students and knowing you’re not alone in the process! Elite Blog Academy. I credit this course with helping me triple my blog traffic and turn my blog into a profitable side business in the first year. The course is intense and very thorough, but you can work through it at your own pace. And you get lifetime access to all future course updates, and the new content added every year makes it well worth going through the whole thing all over again. Elite Blog Academy only opens up for new students once per year, but you can join the waiting list now and get instant access to the “Blog Structure Blueprint” ebook. The Blogger’s Simple Guide to Taxes: A Guide to Saving Time and Money. Sarah is both a blogger and a CPA, so her guide on understanding taxes for bloggers is a must! Don’t let taxes intimidate you, just get this book and get good at tracking your income and expenses. Bluehost. They offer great prices and are a good starting point for beginner bloggers. I used Bluehost for over two years before I outgrew it and decided to make a switch. Dropbox. I use my Dropbox account to store backup files of my blog. My host also stores backups, but it never hurts to also have your own files. The last thing I’d want to have happen is to completely lose my blog due to some weird snaffu. Google Analytics. This is the industry standard tool for tracking website analytics, and it’s free! Google Drive. I store all of my blog files in Google Drive, which makes them easy to access from anywhere on any device. SiteGround. I have a self-hosted WordPress site, which means I need a place for it to “live” on the Internet. SiteGround is my current host and I highly recommend them. Thrive Landing Page Editor. This is a WordPress plug-in that gives me the ability to design custom landing pages on my blog. It adds a ton of capability that the standard WordPress editor lacks, making it a breeze for non-techy people like me to design awesome landing pages like this one: smallstuffcounts.com/crush. WordPress. The content management software I use to run my blog. You can customize it any way you please, and it is the platform of choice for most blogs. Make sure you get a WordPress.org blog account. Go – Responsive Portfolio for WP. This plug-in allows me to create beautiful project galleries of my blog posts (like this one). I can set up a gallery based on blog post categories or tags and can embed them anywhere I’d like. MiloTree Pop-Up. MiloTree is a free plugin that adds a small popup to the bottom of my blog. I can set it up to collect email subscriptions or to ask visitors to follow me on my social media accounts. Pretty Link. This one allows me to create custom URLs on my blog that redirect to any link on the Internet. I use this mostly for my affiliate links – rather than sharing a super long affiliate link to an ebook, I use Pretty Link to create a URL that looks like this: www.smallstuffcounts.com/bookboss . Related Posts by Sovrn. This plugin displays related posts at the bottom of my blog posts. I love that it automatically populates based on post categories, but that I can also manually change the related posts that appear. Social Warfare. This plugin adds social share buttons to your blog posts. It’s a great way to display social proof of your blog content! There is a free version, although I recommend the pro option since it’s a low annual fee and gives you more control over the features. Asana. I use this project management software to track blog post ideas, create my editorial calendar and manage my never-ending blogging to-do list. This free software helps me stay sane! Boomerang Gmail App – This app saves me so much time! It lets you schedule emails to send at a later time, which is very helpful for sending reminders and you can also get reminders to follow up on emails that don’t get a response in a certain number of days. I use this a lot when sending pitches to brands. Crush Your Week: The Complete Guide To Designing An Intentional Weekly Routine. I poured all of my time management strategies into this ebook, including how I carve out time for blogging on top of a full time career. Evernote. I often draft blog posts in Evernote and also keep a note with a running list of post ideas. I also use Evernote as a digital filing cabinet for storing receipts for blog expenses. Google Calendar. I LOVE Google Calendar and how it helps me stay organized. I highly recommend it. InkWELL Press LiveWELL Planner. I use the monthly spreads in my planner as an editorial calendar. I usually plan out my month here, with blog post ideas on mini sticky notes so I can rearrange them. When I have things set, I add them to my calendar in Asana. Keeper. Keeper is an app for storing passwords. I know I’m not the only one with a gazillion variations of user names and passwords to remember, which is why this app is a lifesaver! Organize Your Week Free E-Course. Save your sanity and learn how to create a weekly routine during my free email course. Unroll.me – This is my secret weapon for keeping my email inbox under control. Combine all of the newsletters you receive into a daily digest so you have less email clutter to deal with. I blogged about it here (it’s free!). Zapier. This is a tool that helps you set up automations for endless types of tasks. Take a look at all of the ways you can use it to save time! BoardBooster. This is a scheduler for Pinterest that saves me tons of time! Hootsuite. I use Hootsuite to schedule all of my Instagram posts, and then it sends a push notification to my phone when it’s time to publish them. ConvertKit. 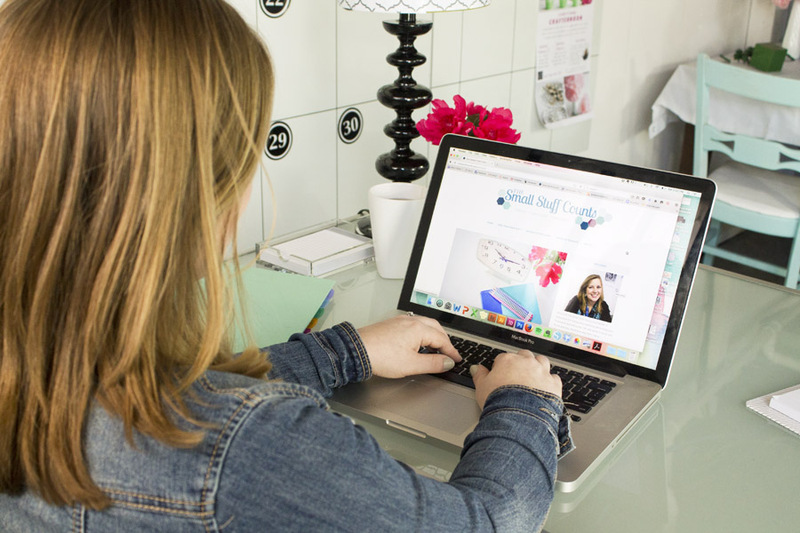 This email service has quickly become a top choice for bloggers. It is easy to use and provides so many powerful automation and segmenting features. ConvertKit has made it so easy to set up my free email courses and to create email sequences for my book. MailChimp. If a beginner blogger asked me what email service to use, I’d recommend MailChimp hands down. You can use them for free up to 2,000 subscribers, which is why they’re so great for beginners. Their email builder makes designing pretty newsletters a breeze. Popup Ally. This WordPress plugin is great for adding subscription boxes to your site. I used the free version for a long time to place an opt-in form at the bottom of all my posts and to add pop-up boxes to my blog. Mediavine. I work with this publisher network to place display ads on my site. Gumroad. I use Gumroad to sell my ebook. It’s simple to use and gives customers a great buying experience. They take care of all credit card processing and taxes, and I get a deposit of my earnings every week. Gumroad also makes it easy to set up affiliates for your products. A Color Story. This is the app I use to edit all of the photos I take on my iPhone and share to Instagram and Facebook. They have a huge selection of filters that make your photos look amazing in a matter of seconds. Adobe Creative Cloud. Photoshop is where I edit all of my photos. InDesign is where I create graphics, printables and ebooks. Illustrator is where I work on branding items like logos. And Adobe Acrobat is how I add text boxes to my printables to users can type into them on their computers. Canon EF 50mm f/1.4 USM Standard Lens. This is a nice lens that allows me to shoot beautiful detail shots of my home decor. Canon EOS Rebel SLR. I have had this camera since college, but it still works for me! It’s a great beginner camera if you’re just getting started with photography and SLRs. I’m currently saving up my money to upgrade, but I still love this camera! Canva. If you are not a graphic designer and need a place to create graphics easily, Canva is an amazing tool. I don’t use it a ton since I have design experience in Adobe programs, but Canva is a fantastic tool – and it’s free! CowboyStudio Lighting Kit. Lighting is so important for taking professional photos! I always use as much natural light as possible, but I often supplement it with these studio lights. iMovie. I use iMovie to edit all of the videos I share on my blog. It’s a sophisticated editting software, but it’s not that tough to learn the basics. Portable Tripod With Rocker Arm Ball Head. This tripod is essential to getting crisp photos of my home and for taking close-ups of craft projects. I used to have a really cheap tripod, but it’s so worth it to spend a little money on something that’s higher quality! Quicktime. This software came installed on my Macbook and allows me to create screen recordings for free. I have a few project tutorials in the works that show screen recordings and it was nice that I had the software already. Universal Cell Phone Tripod Mount Adaptor. I can quickly snap my phone into this mount and attach it to my tripod, which is helpful for doing live videos on Facebook. Thanks for the mention! We appreciate it!